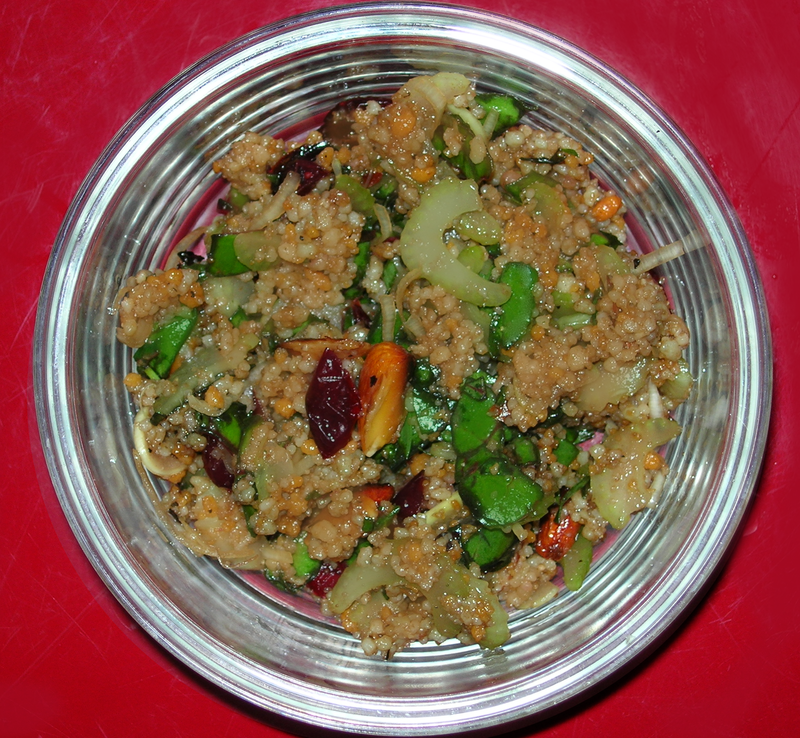 Couscous with Red Chard, Celery, Leeks, Tarragon, Dried Cranberries and Toasted Almonds. This was a fast and easy salad to make. In the morning when I made tea, I poured 2/3 cup of boiling water on 1/3 cup of couscous (tri-color couscous) and sealed the container it was in, letting it rest on the counter until I was ready to make the salad. I also toasted about a dozen almonds in a dry pan and let them cool off on the counter for later. I got out my mandoline for fine slicing. I sliced two stalks of celery and 1/4 cup of leeks. 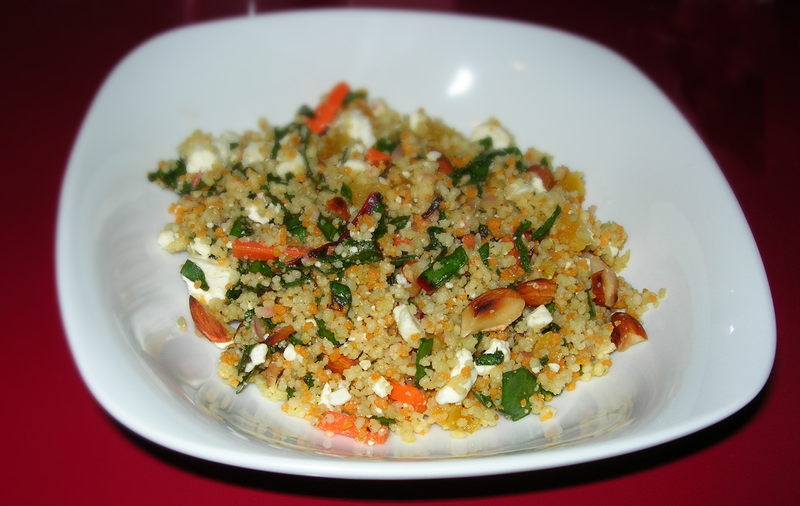 I tossed them in with the couscous along with a handful of dried cranberries. I cleaned two stalks of red chard and rolled them up so I could cut them into thin slices. Then I chopped them the other direction for small pieces. I removed the leave from 1 bunch of tarragon and chopped the leaves up. I chopped the almonds in half and tossed them in. Then I added some salt and pepper and about 1 TBSP of balsamic vinegar and 1/2 TBSP of olive oil. I put the lid back on and shook it all up and let it rest in the fridge so the flavors could marry. This made about 1.5 pints of salad, 4 servings. There is a nice bite from the leeks, a bit of tang from the tarragon, earthiness from the chard and zingy sweetness from the dried cranberries. The balsamic blends the flavors perfectly. Winco had roast pork for $1.66 per pound, so it seemed like a good time for pork roast. While trying to decide what to serve with it, I came across a recipe for Earl Grey-Crusted Pork Loin with Fennel and Apples. 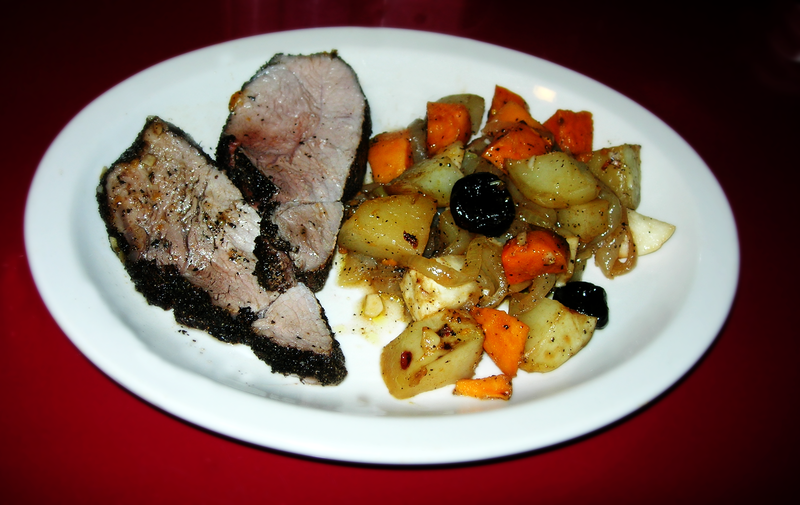 I didn’t have a pork tenderloin and wanted to use some dried cherries, not fresh apples. I like raw apples better than roasted ones, but I thought the recipe gave me something to work with. I preheated the oven to 450°. I cut one small yellow onion in slices and lined the bottom of my paella pan which doubles as a roaster for me. I cut the tops off four Earl Grey tea bags and poured them out onto my cutting board. I added 1 tsp of salt and a tsp of pepper and mixed them together and then I rolled my pork roast in it. It was a three pound roast and was completely coated by the tea, salt and pepper blend. I have never seen anything stick so completely or so well as this tea, it was much easier than doing a pepper coating. I stuck the roast in the oven and let it cook at 450 for 20 minutes. Meanwhile, I peeled and cut 1 yam, 1 turnip and 2 red potatoes into chunks about 1 inch square or so. Now it was time to take the roast out and add the vegetables. I added 1 TBSP of olive oil to a small bowl, added some salt and pepper and 2 cloves of chopped garlic. Then a handful at a time, I tossed the root vegetables in the oil to coat them and then spooned them into the pan around the roast. I added a handful of dried cherries at the end, putting them into the oil, salt and pepper first as well. I put the roast back in the oven at 350° for 40 minutes. I checked the temp and it was 140° which is what I wanted. I removed the roast to rest for 15 minutes and put the veggies back in to finish cooking. I turned it up to broil for the last 5 minutes just to get a nice dark brown crispiness on a few of them. The vegetables were magnificent as roast vegetables always are. The juice from the onions and the pork blended with the dried cherries for a delicious liquid that the vegetables drank up. The real revelation, though, was the pork. The Earl Grey’s sweet and tart bergamot flavor permeated the meat, but with delicacy so it was not overwhelming at all. it was extraordinary, so delicious and so fragrant. I will definitely make this again. After all, it turned a $1.66 per pound cheap roast into something fit for fine dining. This is an easy salad. I knew when I was making coffee this morning that I would make a couscous salad this afternoon, so after I heated my water to press some coffee, I put 1/3 cup of couscous in a container, added 2/3rds cup of my hot water and put a lid on it and let it sit. In 15 minutes, I stuck it in the fridge so it would be cold when I made the salad later in the day. I put about 10 almonds in a dry pan on the stove o medium high heat and let them toast while I was prepping the salad. As son as they were toasted, I removed them from the heat. I sliced and diced 1 TBSP of fresh scallions and diced on small clove of garlic and put them in a bowl with 2 tsps of olive oil, 1/2 tsp of buckwheat honey, 1/2 tsp of mustard and the juice of 1 small fresh lemon. I mixed this all up. Buckwheat honey is thick so it takes a lot of stirring to mix it all in. I removed the stem from 1 stalk of red chard and put it back in the crisper to use in another meal. I chopped the red chard up finely and mixed it into the dressing. There is just enough dressing to coat all the chard. Then I stirred in the couscous and mixed it thoroughly. Next I peeled and cut up one small carrot into small matchstick. I also cut up 3 dried apricots, slicing them as thin as matchsticks and then slicing them in the other direction so they were diced small. I tired in the apricots and carrots and shock a couple tablespoons of feta on top. I chopped up the almonds and tossed them in and then put a lid on the container and shook the ingredients together, mixing them up well. I put it in the fridge for a few hours, letting the dressing flavor everything. It is important to let it rest because when it is first made, the mustard flavor is a bit strong, but it mellows as it merges with the sweetness of the dried apricots and the richness of the feta. I made only a small amount of dressing, so it did not soften the feta, but its flavors still came through. This is a delicious salad and actual prep time was very short. It made one pint, two small servings or one large one. This recipe took a few extra steps to prepare some of the ingredients in advance. To be fair, the pilaf I made in advance was for a different meal. I just made extra so I could use it for another meal. However, I did roast chickpeas in the morning to use for this meal in the evening. 1//2 TBSP of olive oil, salt and pepper. I heated the olive oil to a low medium heat and added 1/2 yellow onion, chopped. I let that cook until it turned translucent. I also diced up 1 clove of garlic and added that about the same time as I added 1 cup of basmati rice that I rinsed thoroughly to remove all the starch. I stirred the rice and garlic into the olive oil and let it all cook about 3 to 4 minutes. The heat was low enough the would not burn, but just toast a bit. I then added 2 cups of cold water and turned the heat up to high, bringing it to a boil. Then I put a lid on it, removed it from the heat and let it steam cook. It was done perfectly in 15 minutes. I pre-heated the oven to 325° Fahrenheit. While it heated, I opened a can of chickpeas and rinsed them thoroughly. i spread them on paper towels and dried them before putting them in cast iron pan. I sprinkled them with some olive oil and roasted for 45 minutes, stirring occasionally to let them cook evenly. When they were crispy and brown, I removed them from the oven, sprinkled them with some salt and a dash of Jamaica Jerk seasoning. I patted them with paper towel again to remove any oil and let them cool. While the onions sautéed, I cut down a small head of broccoli, separating the florets and peeling the stems. I added them to the onions and then chopped up 4 stalks of asparagus, cutting off the tops and adding them and cutting the long stems in half before cutting them into 2 inch long pieces. I added the asparagus next since they cook a little faster than broccoli. Then I cleaned and sliced 4 mushrooms and added them and let them all cook for a bit, adding about 1/4 cup of water after about 3 minutes of sautéeing. I let them cook until the broccoli was nearly tender, squeezed the juice of one large fresh lemon into the mix and let it simmer a bit so the veggies absorbed the juice. Then, I added the pilaf and stirred it in, cooking just until heated. 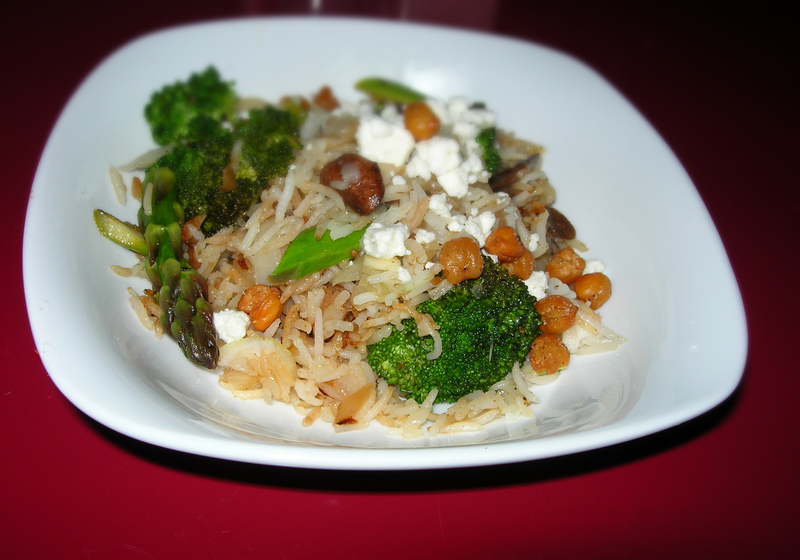 To serve, I put the pilaf and veggie mixture in a bowl, sprinkled some feta cheese on it and topped with a few roasted chickpeas. The flavor blend is amazing. Anise seed really brings out the best in veggies and, of course, works beautifully with feta. The flavors of lemon, feta, anise and veggies were extraordinary and the addition of the crispy, crunchy and spice roasted chickpeas made it blissful. For a vegan option, just don’t add the feta at the end. It is still delicious. This made four servings. I imagine that my lunch tomorrow will be even more delicious! 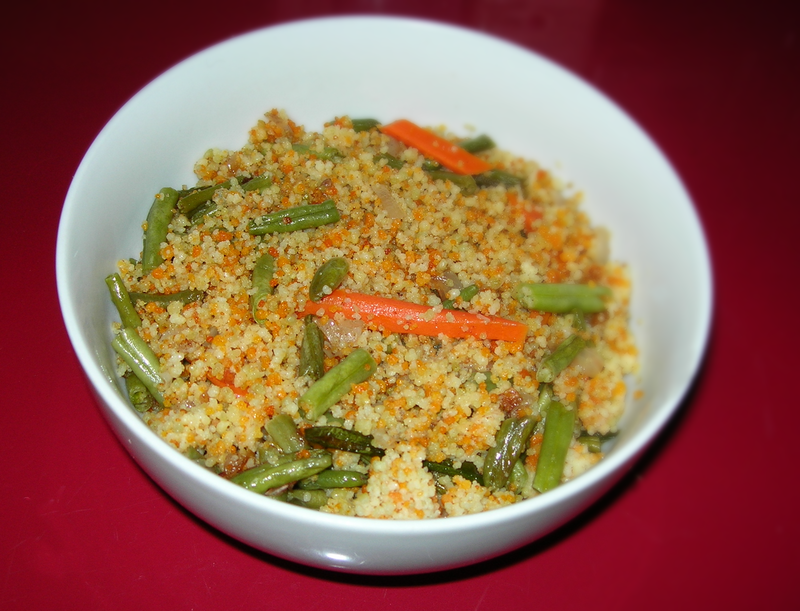 This was heartier than it looks at first glance, those green beans have real substance and make a delicious and hearty lunch. First, I made the couscous by toasting 1 cup of couscous it in a dry pan on medium for about 3 minutes before adding 1 cup of boiling water and putting a lid on it. I set it aside and cooked the vegetables. I used 2 tsps of olive oil. I added some cinnamon and cumin and heated until aroma filled the air. I added 1/2 of a yellow onion, chopped, and salt and pepper, and cooked until tender. I chopped 2 small carrots and 2 garlic scapes into 2 inch long, but thin pieces, the size and shape of green beans. I added them to the oil and sauteed until nearly tender. Then I added 1 cup of frozen green beans and cooked nearly done. Before it was finished, I added the couscous to the pain and let it finish cooking. This made 4 side dish servings or 2 entree size servings. The flavor was hearty, yet light. Winco had some impossibly low-priced linguiça that I picked up a few weeks ago and put in the freezer. I thawed it out for a soup, deciding to try it with a couple rutabagas. I was a bit leery because it was so incredibly cheap ($2.67 for 1 pound) but hoped for the best. Let’s just say that I will be buying it again. It was delicious and made a fabulous soup. Okay, I started with 1 TBSP of olive oil in my soup pot and heated it on a low medium. I added 1 tsp of cumin powder and 1 tsp of cinnamon. While it heated, I chopped1 medium yellow onion, salt and pepper, and tossed it in, letting it sauté until tender. While it was cooking, I pelled a 1 inch piece of fresh ginger and shredded it. I then added 2 cloves of minced garlic and sautéed everything together. The aroma was heady. I added the linguiça and let it cook a bit, so it was browned before I added 1 quart of water and turned the heat up to a simmer. Now I peeled 2 carrots and 2 rutabaga and 1 apple and chopped them up into small pieces. I did not worry about regularity as I planned to puree the soup, but it would cook faster with smaller pieces. I added them all to the soup, tossed in some salt and pepper and let it cook until tender. I removed the linguiça and set it aside. I let the soup cool down, coming back an hour later to puree the soup. An immersion blender works best, but I don’t have one, so I used my Magic Bullet. After it was pureed, I added back the linguiça that I had chopped into 1/2 inch long pieces. 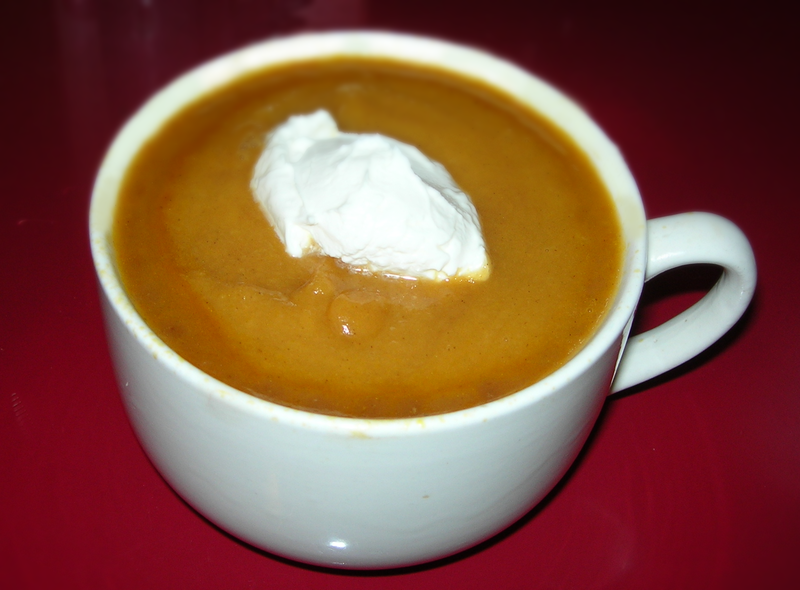 I reheated it using the microwave on low and added a dollop of sour cream for that hot-cold, spicy-sweet and sour contrast. I made a similar soup several times, but this has a different flavor profile with the cinnamon and the linguiça and is, I think, a better version. 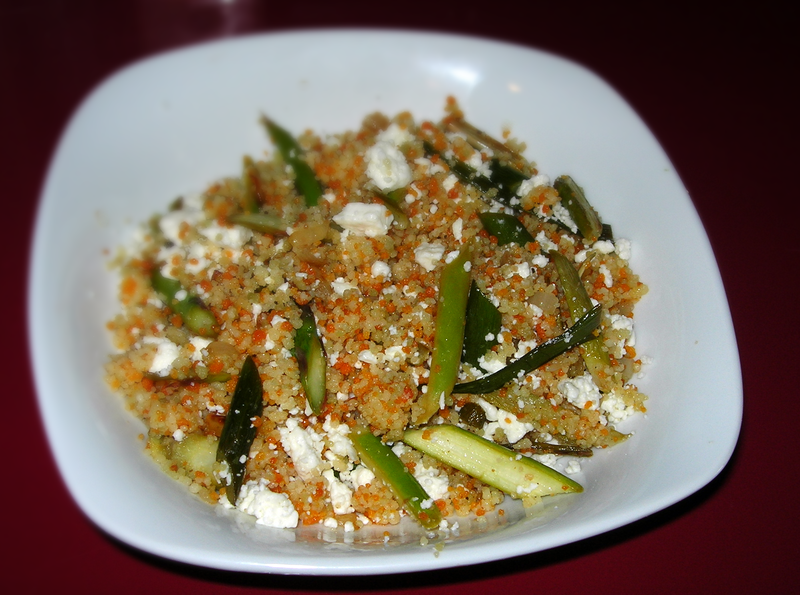 I made a quick and easy lunch with some asparagus, garlic scapes and couscous. First, I set 1 cup of couscous in a kettle on medium heat to toast a bit. This is not a required step and you can always skip it but I like the added nuttiness you get if you toast the couscous first. In a teak kettle I heated water. I then removed the couscous from the heat. I added 1 cup of boiling water and put a lid on it and let it do its thing. In a few minutes I removed the lid and forked the couscous, lofting it so it did not get sticky. While this was going on, I chopped 1/2 of a small onion and added it to 1 TBSP of olive oil heated to medium in a sauté pan. I added about 1 tsp of ground cumin and salt and pepper. I let the onions sauté while I cut up about 5 asparagus stalks and 4 garlic scapes. The stalks were mid-sized so I cut them in half before slicing them and the garlic scapes on a diagonal. Cutting them in half lets them cook a little more quickly and evenly. The diagonal slicing makes them look prettier in the dish. I added the asparagus and garlic scapes to the onions and let them all cook until done, tender but still toothsome. I then squeezed in the juice of one lemon and let it cook into the veggies for about a minute or so before adding the couscous and stirring it all together. This made two servings. One for a hot lunch and one for a cold salad later in the day. Sprinkling some feta on top and mixing it in added just the right amount of bite. Spring means fresh garlic scapes – a delicious and transient treat to look forward to each year. Because their season is so short, you have to take full advantage of it. So, I decided to have scapes for breakfast. Scapes can be a little tough if they are not well cooked, so I cooked them before putting them in the omelette. I cut the tops off three scapes and 2 green onions. I sliced the scapes down the center and then chopped the scapes and green onions into pieces about 1.5 – 2 inches long. I heated 1/2 tbsp of butter in a small pan and sautéed the scapes and green onions with salt and pepper until they changed color. Then I added just enough water to cover them and let them simmer for about five minutes until tender. I drained the fluid off and let them rest before adding them to the omelette. For the omelette, I used three eggs which I whisked 2 tbsp of water and 1/4 tsp of paprika because its smokiness will complement the garlic. I heated my griddle to 250° F and melted as little butter as possible to coat the surface. I poured the omelette mixture and let cook. I did not add salt. Salt is good on fried eggs, eggs sunny side up, eggs over easy , but for scrambled eggs and omelettes – when the yolk is mixed with the whites, salt will make the eggs get tougher and rubbery. No salt makes tender eggs .Add the salt when you are done. 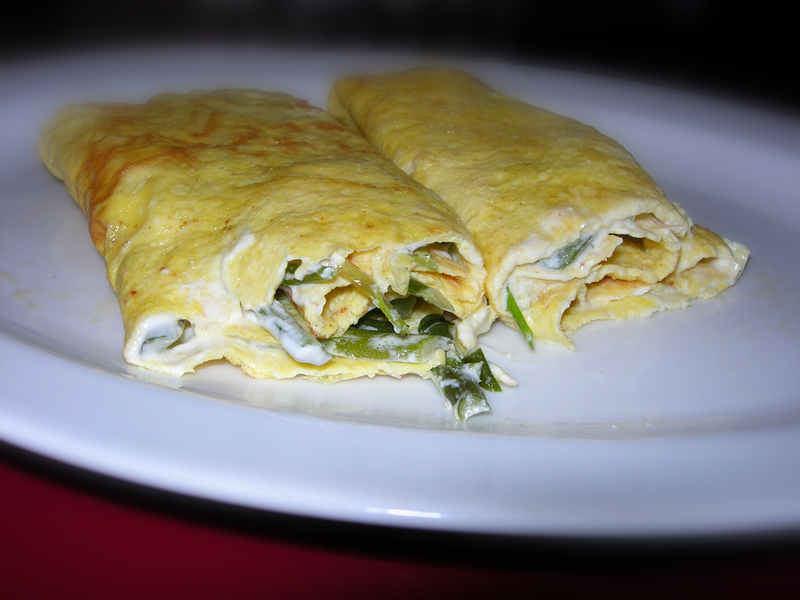 I spread the scapes and green onions over the omelette mixture and dropped two small dollops of sour cream on top. Then using a thin piece of wood (a lefse turner) I rolled the omelette up. You can use a very thin spatula, but I love my lefse turner. I make omelettes on a lefse griddle. It’s hard to go wrong with such precise temperature control and all the space in the world for the omelette to spread out thin. The edges are shallow, so it’s easy to lift the edges of the omelette for turning – with no sides of a fry pan interfering with your ability to get under the omelette. The blend of garlic scapes, green onions and sour cream was delicious and the hint of paprika smoke was perfect.